Logical atomism is a philosophical belief that originated in the early 20th century with the development of analytic philosophy. Its principal exponents were the British philosopher Bertrand Russell, the early work of his Austrian-born pupil and colleague Ludwig Wittgenstein, and his German counterpart Rudolf Carnap. The theory holds that the world consists of ultimate logical "facts" (or "atoms") that cannot be broken down any further. Having originally propounded this stance in his Tractatus Logico-Philosophicus, Wittgenstein rejected it in his later Philosophical Investigations (secs. 46–49, 91 and sec. 81). The name for this kind of theory was coined in 1918 by Russell in response to what he called "logical holism"—i.e., the belief that the world operates in such a way that no part can be known without the whole being known first. This belief is commonly called monism, and in particular, Russell (and G. E. Moore) were reacting to the absolute idealism dominant then in Britain and exemplified in works of F. H. Bradley and J. M. E. McTaggart. The term was first coined in a 1911 essay by Russell entitled "The Basis of Realism." 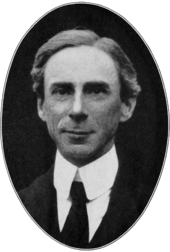 However, it became widely known only when Russell gave a series of lectures in 1918 entitled "The Philosophy of Logical Atomism". Russell was much influenced by Ludwig Wittgenstein, as an introductory note explicitly acknowledges. Russell and Moore broke themselves free from British Idealism which, for nearly 90 years, had dominated British philosophy. Russell would later recall in "My Mental Development" that "with a sense of escaping from prison, we allowed ourselves to think that grass is green, that the sun and stars would exist if no one was aware of them". The first principle of logical atomism is that the World contains "facts". The facts are complex structures consisting of objects ("particulars"). This he defines as "objects' relations in terms of atomic facts" (PLA 199) is a fact, either from an object with a simple property or from different objects, in relation to each other more easily. In addition, there are judgments ("beliefs"), which are in a relationship to the facts, and by this relationship either true or false. In his Tractatus Logico-Philosophicus, Ludwig Wittgenstein explains his version of logical atomism as the relationship between proposition, state of affairs, object, and complex, often referred to as “Picture theory”. In view of Russell’s version, the propositions are congruent in that they are both unconvoluted statements about an atomic entity. Every atomic proposition is constructed from “names” that correspond to “objects”, and the interaction of these objects generate “states of affairs,” which are analogous to what Russell called atomic facts. Where Russell identifies both particulars and universals, Wittgenstein amalgamates these into objects for the sake of protecting the truth-independence of his propositions; a self-contained state of affairs defines each proposition, and the truth of a proposition cannot be proven by the sharing or exclusion of objects between propositions. In Russell’s work, his concept of universals and particulars denies truth-independence, as each universal accounts for a specific set of particulars, and the exact matching of any two sets implies equality, difference implies inequality, and this act as a qualifier of truth. In Wittgenstein’s theory, an atomic complex is a layered proposition subsuming many atomic propositions, each representing its own state of affairs. Wittgenstein's handling of belief was dismissive, and reflects his abstainment from the epistemology that concerned Russell. Because his theory dealt with understanding the nature of reality, and because any item or process of the mind barring positive fact, i.e. something absolute and without interpretation, may become altered and thus divorced from reality, belief exists as a sign of reality but not reality itself. Wittgenstein was decidedly skeptical of epistemology, which tends to value unifying metaphysical ideas while depreciating the casewise and methodological inspection of philosophy that dominates his Tractatus Logico-Philosophicus. Furthermore, Wittgenstein concerned himself with defining the exact correspondence between language and reality wherein any explanation of reality that defies or overburdens these semantic structures, namely metaphysics, becomes unhinged. Wittgenstein’s work bears the exact philosophical determinants that he openly admonished, hence his later abandonment of this theory altogether. The immediate effect of the Tractatus was enormous, particularly by the reception it received by the Vienna Circle. However, it is now claimed by many contemporary analytic philosophers, that the Vienna Circle misunderstood certain sections of the Tractatus. The indirect effect of the method, however, was perhaps even greater long-term, especially on Logical Positivism. Like Russell, Wittgenstein eventually rejected Logical Atomism. This rejection culminated in the posthumously published book, Philosophical Investigations. 1 2 "Russell's Logical Atomism". Stanford Encyclopedia of Philosophy. ↑ Russell B., (1944) "My Mental Development", in Schilpp, Paul Arthur: The Philosophy of Betrand Russell, New York, Tudor, 1951, pp. 3–20.